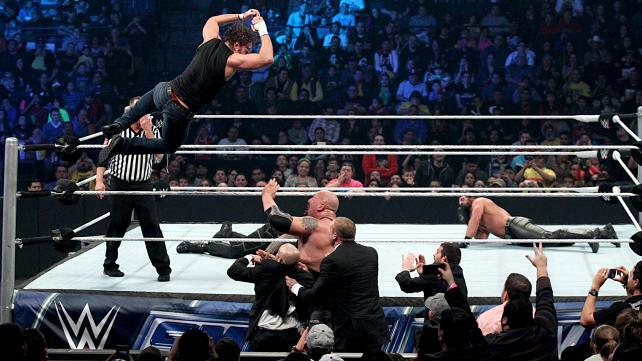 It was an explosive night as the WWE gave us the last Friday Night SMACKDOWN from Laredo, TX! (For those of you who live under a rock, Smackdown is returning to Thursday starting next week.) In the wake of the justified firings of Dolph Ziggler, Erick Rowan, and Ryback, the Authority bestowed the WWE Universe with a night filled with hard hitting excitement it would not soon forget. So lets send Friday nights out in style, and jump on into this weeks installment of SMACKDOWN! Our hero and savior of the WWE, Seth Rollins, opened the show as he triumphantly came down to the ring to address the WWE Universe. The living embodiment of the future wanted to continue the joyous celebration of the Authority’s return to power. Seth humbly mentioned how he guided John Cena to make the decision that was best for business and the unfortunate consequences of Cena breaking his word to his friends. But he insisted that we not villainize John for abandoning his friends, knowing full well what it would mean, but we should thank him for doing what was best for business. And thanks to Cena, the main event at the Royal Rumble would be a triple threat match Brock Lesnar vs John Cena vs SETH ROLLINS for the WWE World Heavyweight Championship. Mr. Money in the Bank then attempted to show respect to the three men who lost their careers (thanks to John Cena’s word meaning diddley squat,) by having the ring bell ring 10 times in a moment of silence. However former Shield business partner, Roman Reigns, decided that he would destroy the solemn moment by sticking his nose where it had no business being. 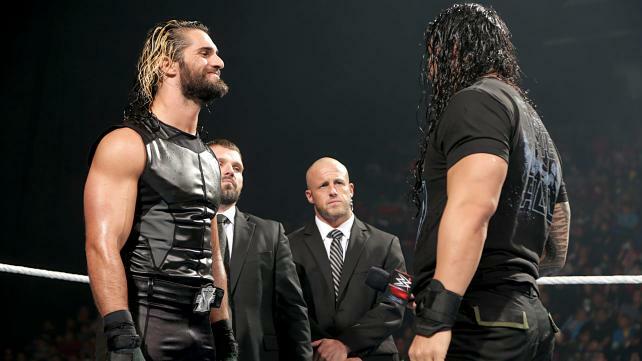 Despite his rudeness, Rollins greeted him as a brother but only received insults and an unwarranted attack. J & J Security pulled Seth up the ramp where he was joined by the Big Show and Kane. The Director of Operations, tasked with keeping order, was forced to make an example of the Samoan Superman. He announced that the main event for the night would be Seth Rollins and the Big Show vs Roman Reigns and a partner of his choosing. The Corporate Demon made sure to mention that anyone who did decide to team with Reigns would also incur the disfavor of the Authority. The resident party god and one third of the New Day were set to go one on one yet again. The rematch a result of Tyson Kidd and Cesaro interfering in their previous battle on RAW. Big E showed his dominance early, looking to overpower Adam Rose. However, Rose used his speed to his advantage and mounted a solid offense keeping his opponent. Big E would not be kept down as he fought back and scored a huge belly to belly suplex. The two would continue to trade offensive maneuvers, either refusing to let the other remain in control for long. Big E ended up countering one of Adam’s moves directly into a Big Ending to pick up the win. This match was much more fun than I ever gave it credit of being. 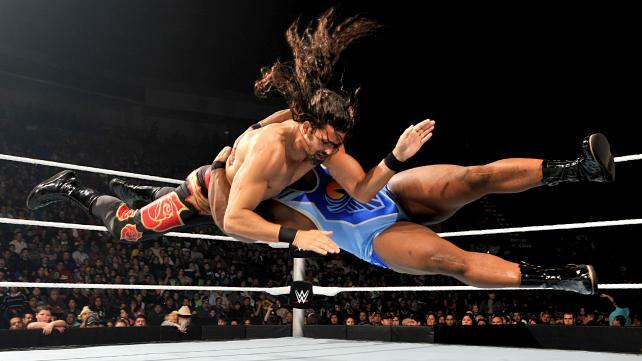 I expected Adam Rose to get steam rolled by the obviously more powerful Big E, but this was not the case. He held his own and even though he did not come out on top, he gave as good as he got. Big E also surprised me. I was pleasantly surprised that he had in ring chemistry with Rose and that this match was as engaging as it was. The pace was quick and it had a clean finish (which should surprise us all since Tyson Kidd *minus Nattie, praise the Wrestling Gods* and Cesaro were ring side.) I still smell 6 man tag in the future. My beloved Ascension were set to take on two more sacrificial lambs… I mean… Local Wrestlers. Let’s face it, these offerings served no more difficult for the dominant team of Konor and Viktor than the previous noobs before them. Konor began the beat down, but always one to share the joy of causing pain to another being, he tagged in Viktor who continued the abuse. The two Ascension boys then granted mercy ending the suffering of their opponent with a Fall of Man to pick up the pinfall victory. I know I keep saying this, so I’ll keep it short. I love seeing the Ascension beat down their victims (violence gives me a happy ^_^) but, I want to see Konor and Viktor tear it up in the tag team division against opponents I’ve been dying to see them against. Against teams that are to their caliber. I hate to see them wasted on teams that don’t even have names. Naomi wasted no time getting started and landed a brutal drop kick as soon as the bell ring. She continued to bring it to Alicia by not relenting in her vicious offense. Naomi controlled her opponent for the duration of the bout but the resilient Fox picked up the win buy pinning Naomi’s shoulders as she used the ropes for leverage. Praise the Wrestling Gods in their Divine Squared Circle, a Diva’s match that was on par with their male counter parts. Naomi and Alicia were on fire! They work damn well in the ring together and everything flowed near seamlessly. Loving the aggression that came out of this match. Both women are highly talented and have given me hope for the main roster’s Diva’s division. I know there will be another match between these two, and I eagerly look forward to it. All three teams know what it’s like to be the champion. Jimmy and Jey, the current tag team champions, squared off against former champions, the Miz and Mizdow, and Gold and Stardust. This triple threat match for the titles began with Jey Uso facing off against the Miz. The WWE’s resident movie star set a slow pace attempting to keep control for his team, however, the energetic Jey was having none of it and quickly shifted the momentum in his favor. Miz did his best to weather the Uso onslaught and was in the midst of wresting control from the Samoan twins when a blind tag from Stardust, sent the Hollywood A lister back to his corner. One half of the Cosmic Twins attempted to picked up the beating wear the Miz had left off but he was unable to Jimmy tagged in his brother Jey. The Usos continued to dominate Stardust but it wasn’t to last as Goldust tagged in getting in a few quick offensive hits. The action spilled outside the ring as the Dust Brothers and the Miz were tossed to the outside (Mizdow was gracious enough to toss himself). Things would continue to break down with wrestlers flying about all willy nilly but in the end it was the Usos that came out on top of the blitzkrieg of bodies. When the action returned to the ring, the Miz tagged himself in against a reeling Stardust. But Mizdow, seeing that his partner was in trouble against Stardust, tagged in to save the day. However, the Cosmic Twins had the stunt Doubles number and proceeded to give him a stellar thrashing. The stars aligned in such a way that when Mizdow was able to make a tag, the Miz was no where to be seen and the Usos found themselves to be the legal men once again. Jey Uso was fired up as he dropped Stardust with a superkick and it was all Uso until Goldust rescued his brother and tagged himself in. It wasn’t long before chaos again took hold as Miz and Mizdow got involved and then ejected from the ring by the legal men. But it was ultimately a miscalculation of communication between the bizarre ones that kept the remainder of the match all Uso. Jimmy picked up the win to retain the titles with a big splash on Goldust. While the beginning of this match was slow it built to a huge crescendo of excitement. Mizdow FINALLY got some actual ring time and got a huge pop from the crowd. It’s good to see this because it’s something I’ve wanted to see for Damien for a long time. These three teams did an excellent job of keeping things fresh (because Gods know they’ve been in the ring against one another often enough *cough cough* Ascension *cough cough*). Everyone has a bad day. This includes new Intercontinental Champion, Bad News Barrett. But to be fair, he was facing Sin Cara so he prolly wasn’t giving 100%. Wade started off strong showing that he could control the luchadore. But it was Sin Cara’s speed and high flying ability that was Barrett’s undoing as he was pinned 1, 2, 3. But the night was not yet complete as BNB would take his frustration at getting a loss out on the smaller wrestler in a ferocious attack. He may have lost the match, but Bad News Barrett was the one standing tall in the end. No idea why Wade is facing Sin Cara, nor why he lost to him. Perhaps it was to show case Barrett’s bad temper, but those of us who know and love the British brawler know this already. But really, who likes losing anyway? Much less to Sin Cara? Does this mean Sin Cara is in the hunt for the IC Championship? Well that’s just silly. It was a fluke and I’d be willing to bet that next time, he high flier will be easily grounded on the Wings of Change. Who in their right mind would join Roman Reigns in his match against The Big Show and the savior of the WWE, Seth Rollins? Why someone who isn’t in his right mind in the slightest! The Unstable Dean Ambrose, joined his brother in his unwise battle against the Authority. He shot out like a bullet towards Mr. Money in the Bank picking up where he left off. Seth valiantly fought off the attack and regrouped outside of the ring with his Authority comrades. He bravely volunteered to start the match against the Lunatic Fringe and the battle continued in the ring. Ambrose took the fight straight to the undisputed future of the WWE, taking control early with quick jabs and a big cross body that kept Seth on the defensive. Things would go from bad to worse as Dean tagged in the Roman. The unfair abuse of Seth Rollins continued as a series of quick tags kept him unable to defend himself. Finally, thanks to the Big Show (omg he is good for something!) Seth was able to escape and tag in his partner. The Big Show slowed down the match and began to concentrate on Dean’s injured knee. Seth, not wanting to make his partner do all the work, tagged back in and also targeted the Unstable one’s knee. The heroic Authority boys continued to punish Dean in brutal blow after brutal blow, but Ambrose would not stay down and somehow he found the strength to tag in the powerhouse Roman Reigns to go toe to toe with the future champion. Reigns delivered Superman Punch after Superman Punch but the Big Show put an end to that craziness with a chokeslam to the Samoan Superman. Things broke down and began to come to a close as Dean Ambrose proved he was as hard to kill as a cockroach when he flew from the top rope delivering a flying elbow to Kane, J & J Security and the Big Show. Back in the ring, Seth seeing his chance to put down Reigns went for the curb stomp, but in what I can only describe as an act of compassion, he missed the maneuver and allowed himself to be speared and pined by Roman. This was an incredible match. Not even the Big Show detracted from this match but actually added to it. Everyone worked well and holy crap all my Shield boys were in the ring together! Yeah I know, not exactly the reunion most were hoping for but it was something and each one showcased why they are special. People give hell to Roman because he isn’t as skilled on the mic. Guess what, he killed it last night. Dean being put into this story only intensifies it and brings more intrigue because of how things ended between him and Seth at Hell in a Cell. And of course there is Seth Rollins (my hero). His shone brightest. He is always golden on the mic, and his humanitarian gesture to once again let Roman pin him was a selfless act that needs to be acknowledged. But now the question is, how will the Authority react to the insolence shown to them by Dean Ambrose? All actions have consequences, and everything done will be because it is Best for Business. This entry was posted on Saturday, January 10th, 2015 at 10:21 pm	and is filed under Events, News, Television. You can follow any responses to this entry through the RSS 2.0 feed. You can skip to the end and leave a response. Pinging is currently not allowed. « Top 10 Books That Need To Become Movies!! !